Keeping the typeface clean was an inconvenient, often messy job. This was especially true if the typewriter was a "blind" writer, where the typebars hung down in a circle where it was difficult for the operator to reach. Over the years, many inventors put their minds to alleviating the drudgery of this necessary task. 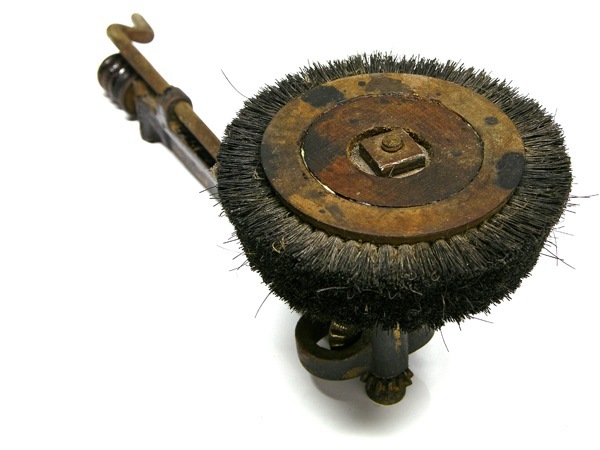 One of these inventions was the Standard Type-Cleaner, shown below. 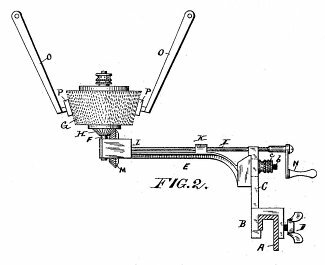 The device sat within the lower part of the type basket, connected by a horizontal piece to a mounting bracket attached to the frame. A crank and thumb screw protruded through the bracket, enabling the unit to be operated from outside the machine. By loosening the thumb screw, one could raise and lower the brush--down out of the way of the type bars when not in use; up into the main part of the basket when it was time to clean. The following passage from the July 1, 1893 issue of Pitman's Journal of Commercial Education implies that the device was imported to the US from elsewhere. The Mr Rose in the piece is H.L. Rose, no apparent relation to Frank or George Rose of the Rose Typewriter Co.
We are indebted to Mr Rose, the courteous manager of the Densmore Typewriter Co., for the first sight of the new "Standard Type Cleaner" just introduced into this country. This type cleaner is adapted to the Densmore, Remington, and Caligraph machines, and is certainly as ingenious as it is effective. By means of a simple attachment a round brush is fixed in the basket of the machine. This brush can be raised or lowered at will, and is driven by turning a small handle on the outside of the machine. Unlike similar devices, this type-cleaner is set in operation without the trouble of raising the carriage or moving the ribbon, or risk of straining the type. Soiling of the fingers is also avoided. There should now be no excuse for dirty type. However, the patent shows that it was invented by Thomas H. Stackhouse of Philadelphia. Stackhouse held several other patents, as varied as a cuff fastener, a mimeograph machine, a motor fuel formula, a machine for fabricating sheets of pyroxylin, and a strange visible typewriter. The latter was assigned to Wyckoff, Seamons, & Benedict, though presumably nothing more ever came of it. The Standard Type-Cleaner cost $2.